Heated Leather Seats, Nav System, Moonroof, Satellite Radio, Premium Sound System, Onboard Communications System, iPod/MP3 Input, VOICE-ACTIVATED TOUCHSCREEN NAVIGATIO... TRANSMISSION: 6-SPEED POWERSHIFT AUTO... Aluminum Wheels AND MORE! Leather Seats, Sunroof, Heated Driver Seat, Back-Up Camera, Flex Fuel, Premium Sound System, Satellite Radio, iPod/MP3 Input, Onboard Communications System, Aluminum Wheels, Remote Engine Start, Dual Zone A/C, Smart Device Integration, Brake Actuated Limited Slip Differential, Heated Seats. Rear Spoiler, MP3 Player, Keyless Entry, Steering Wheel Controls, Child Safety Locks. VOICE-ACTIVATED TOUCHSCREEN NAVIGATION SYSTEM pinch-to-zoom capability, SiriusXM Traffic and Travel Link w/a, SiriusXM audio and data services each require a subscription sold separately, or as a package, by Sirius XM Radio Inc, If you decide to continue service after your trial, the subscription plan you choose will automatically renew thereafter and you will be charged according to your chosen payment method at then-current rates, Fees and taxes apply, To cancel you must call SiriusXM at 1-866-635-2349, See SiriusXM Customer Agreement for complete terms at www.siriusxm.com, All fees and programming subject to change, Sirius, XM and all related marks and logos are trademarks of Sirius XM Radio Inc, TRANSMISSION: 6-SPEED POWERSHIFT AUTOMATIC SelectShift w/thumb switch on gear shifter (STD). 2018 Ford Focus with Shadow Black exterior and Medium Soft Ceramic interior features a 4 Cylinder Engine with 160 HP at 6500 RPM*. 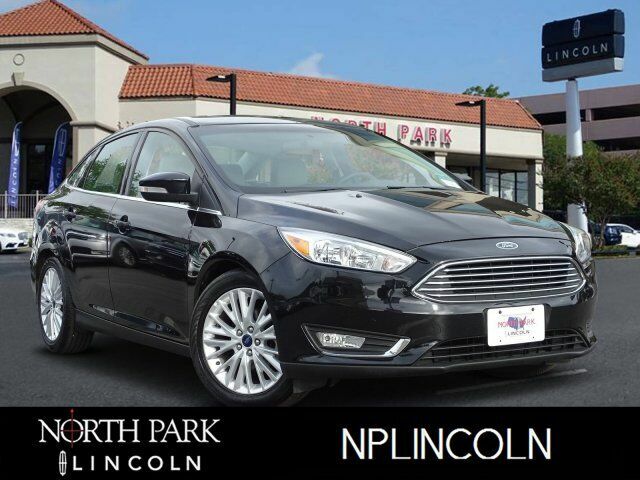 CARFAX 1-Owner Ford has tuned the suspension masterfully, imbuing even this economy-minded model with a playful, light-on-its-feet character. -Edmunds.com.